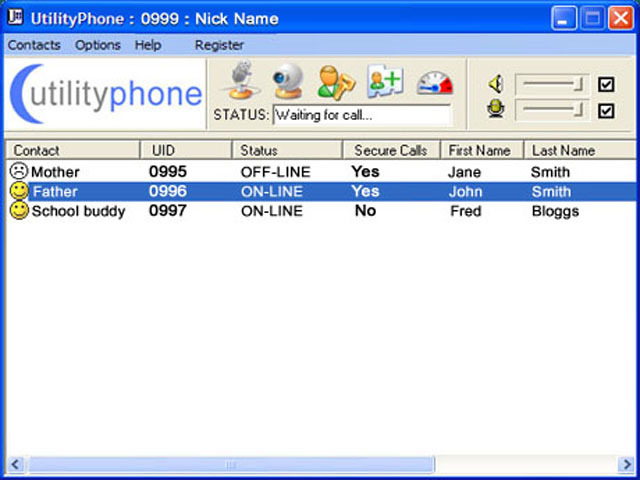 Utility Phone is free Worldwide PC-to-PC communications using: voice, video, online/offline text messaging, text chat and file transfer, all secured using AES 256 bit encryption. features include activity notifications and privacy mode. For corporate V.O.I.P. peering solutions, UtilityPhone can supply a private contact server so that a corporation can limit communications within their own private group. Subscribers may fix/lock their User I.D..
...... today! Recieve notfications when your contacts go online or offline. Messages sent to a recipient who is offline are stored and sent to that contact when they come online. Although Utility Phone is FREE to use, subscribers may fix/lock their User I.D. Utility Phone is the only application you need to secure all of your Internet based communications. For crystal clear voice conversations, video conferencing, text chat and file transfer, between 2 people and their PC's (Worldwide), with ZERO per minute fees and unlimited usage, Utility Phone is a must have for everyone. This the only service that utilizes AES 256 bit encrytion to protect your audio / video conversation, text chat, file transfer, your business and your family. Best of all, the Utility Phone software and Worldwide service is FREE to use. After 7 days your User I.D. will expire but a new U.I.D. can be issued for another 7 days, for FREE, indefinately. Qweas is providing links to Utility Phone 2.0 as a courtesy, and makes no representations regarding Utility Phone or any other applications or any information related thereto. Any questions, complaints or claims regarding this application Utility Phone 2.0 must be directed to the appropriate software vendor. You may click the publisher link of Utility Phone on the top of this page to get more details about the vendor.